From the moment you walk in, you'll feel the welcoming atmosphere from our custom-designed surroundings. The ample use of glass and extra high ceilings create an open and spacious feeling. The warmth of a glowing fireplace and well appointed artwork offer an at-home feeling. Granite and light woods add a final touch of quality. 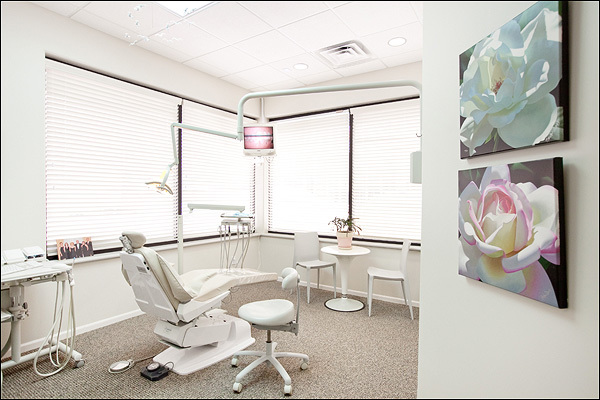 The treatment rooms are particularly unique and unlike any typical doctor's office. Instead of the usual "cubicle", the rooms are designed as a large open space with additional seating. If a parent or family member wishes to observe during your child's appointment you are always welcome to do so. It was only a few years ago that it was popular to have all the patient chairs lined up in a row with only a cabinet between. Unfortunately, this has been shown to be one of the major sources of cross contamination of airborn organisms and also a breach of privacy when discussing personal matters or your health history. 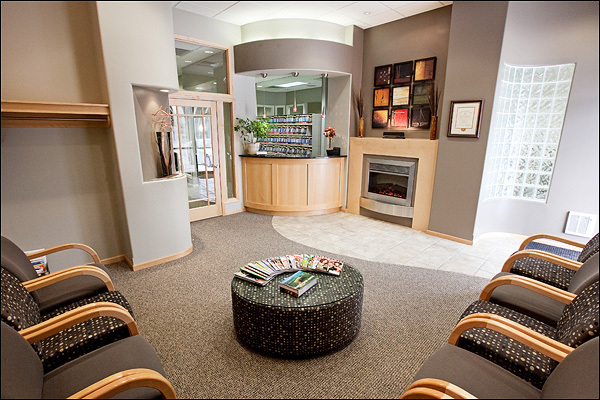 Each treatment area is a private room where confidential discussions can remain quite private. Each room is designed and arranged for your comfort with pleasant XM-Sirius music, cable TV, and filtered air that is purified to leave only the pleasing scents. The TV monitors also function to display digital X-ray or intra-oral video images if you care to observe the recorded information during the diagnosis phase of care. Original artwork by an Omaha artist decorates each room with soothing pastoral scenes. 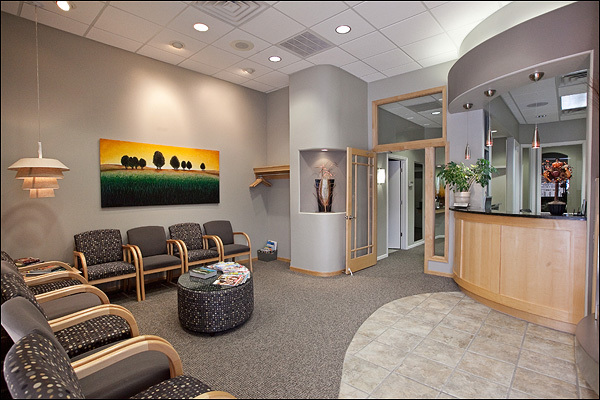 The observation most patients remark on is the total cleanliness of the office. 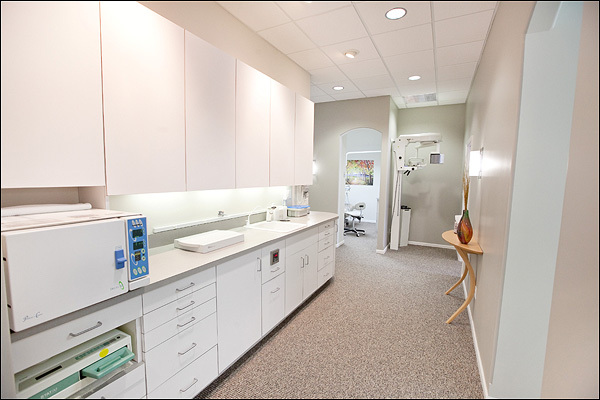 Colors and surfaces were selected with particular attention to exceeding in every way the standards recommended by the American Dental Association and the CDC (Center for Disease Control). 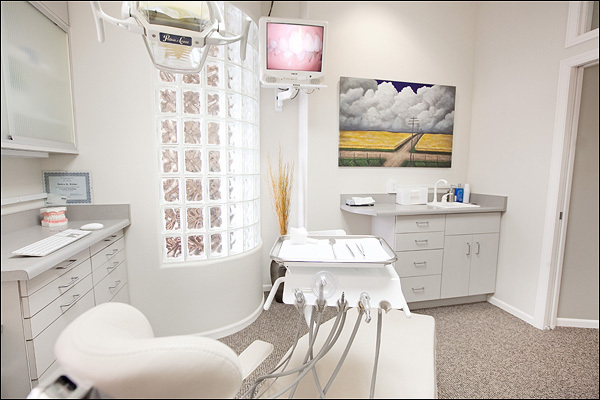 Each dental instrument goes through all the prescribed steps of sterilization using the most efficient, modern equipment available. We are truly dedicated to your health and safety. 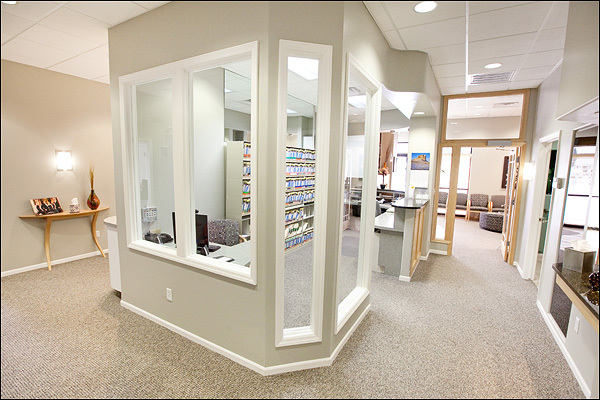 There is an abundant use of glass to create an openness of space while protecting the privacy of doctor-patient discussions. The hallways are extra wide to accommodate wheelchair traffic and for those who need assistance. Clearstory windows are employed to bring natural light to all areas of the office. Mechanical hardware is strategically isolated to keep a quiet restful environment.